I can hear you snorting from here – “Why the hell would you need an article on how to jack up the car?” I get that, but as it’s the first step in many service steps, and there are a few DB9 specific tips to share, I figured I’d post a quick article and video in case it helps someone. 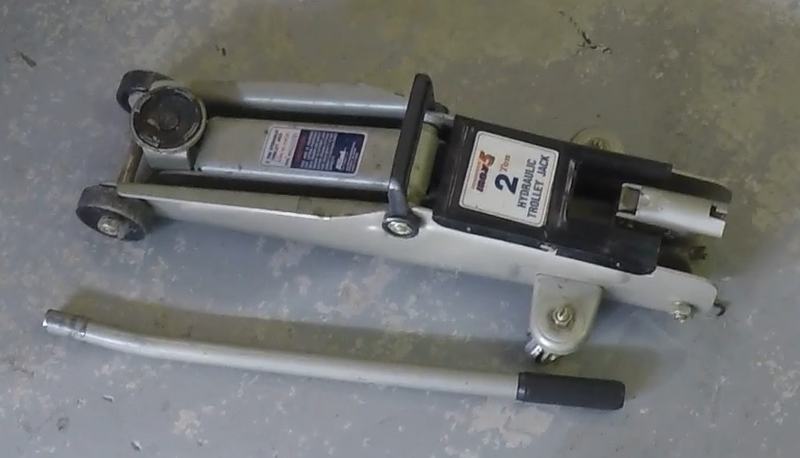 I used a simple 2 ton trolley jack. My first tip (that I really learned from a post on 6speedonline.com) is to use a hockey puck on the jack lifting point to avoid scratching the car. Another tip: If you are going to be taking off the road wheel – I’d suggest cracking the wheel nuts loose before you lift the wheel off the ground. It’s easier if the wheel isn’t free to rotate. 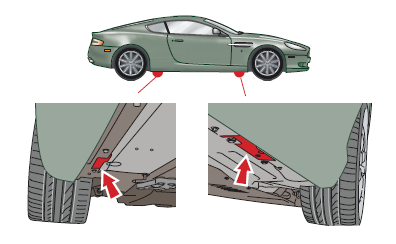 Another warning from Aston: They say to never use a single point jack to raise just one corner of the car if you have the central under tray/stiffener (tunnel shear panel) removed from the car. My guess is that without the stiffener, you run the risk of twisting the car if lifting at a single point. You’d need to be using a four point host lift in this case. If you’d like to read the actual page from the Service Manual on Lifting and Jacking, you can find it here. If you plan on jacking the car at all four corners to put it up on jack stands, maybe you’ve realized the conundrum by now. Whether you have or haven’t, please check out this other post on how to accomplish it. Hi Steve, l’ve just come across your site tonight. a lot of useful information on here for me to go through. I recently purchased a 2006 DB9 Volante at the end of last summer. the car is now laid up for the Winter. my first job on it is to change the spring / damper units all round. the front offside spring is broken. I have a set of 6000 mile units ready to go on.my car has done 44,000 miles. I am sure l will have many questions as l get into working on the car – which l love ! Very cool, the Volante’s are beautiful. I was looking at the springs and dampers, mine are just slightly weepy, so not time to change yet. They looked like they would be fairly conventional to service at least, and hopefully a DIY project as long as you have a spring compressor. Let me know how yours turns out!